In its place, Dennis Richter proposes eight-story building wrapping around Eager and Cathedral streets. 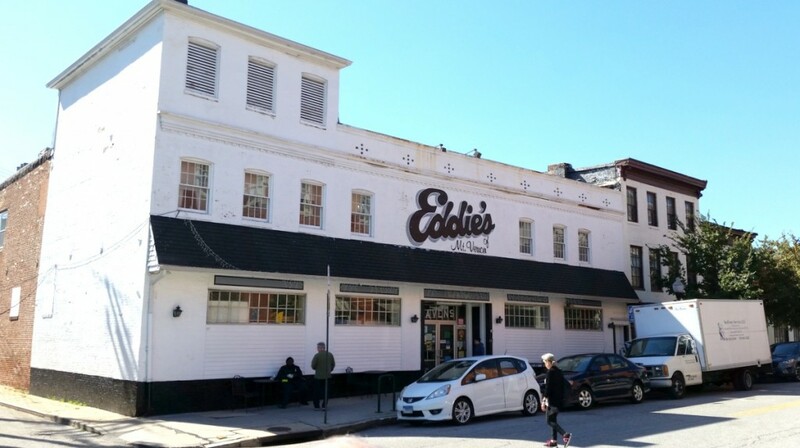 Developer Dennis Richter won approval yesterday to tear down Eddie’s, Mount Vernon’s only grocery store, to make way for a $30 million apartment and retail complex. Baltimore’s Commission for Historical and Architectural Preservation (CHAP) voted 9 to 2 to approve Richter’s request to demolish the grocery store at 7-11 West Eager Street and the former Eager House restaurant at 13-15 West Eager Street. The demolition would clear the way for a mixed-use development containing about 100 apartments and 15,000 square feet of street level commercial space, including a possible new grocery store. 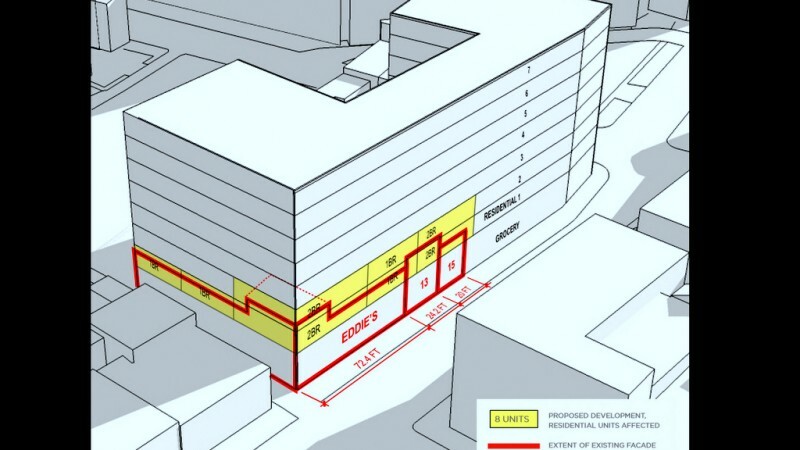 The developer had submitted a conceptual plan that calls for a building rising up to eight stories, with underground parking for almost 50 cars. Despite yesterday’s vote, Richter can’t move ahead with demolition until designs for a replacement building are approved by the preservation commission at a subsequent meeting. But the vote gave him the green light to proceed with his approach. The preservation commission appeared to put the brakes on the development last month when it voted 5 to 3 to reject a request to remove Eddie’s and the former Eager House from a list of structures considered “contributing buildings” to the Mount Vernon Historic District. When structures are deemed contributing buildings in a historic district in Baltimore, the panel has the authority to review and approve any proposed changes to the exterior, including demolition. That vote paved the way for yesterday’s hearing, at which the developer had a chance to address the economic implications of retaining the buildings currently on the site. Richter argued that it wouldn’t be feasible to build the project he wants to construct if he has to incorporate the existing buildings. He said retaining the existing buildings would prevent him from creating underground parking and would limit the number of apartments he could create. Clearing the site, Richter said, would enable him to build a larger project that would have a more beneficial impact on the surrounding area. He also said he plans to preserve and restore a 19th-century rowhouse at 917 Cathedral Street. “We don’t think it’s feasible to retain the facades of these buildings and incorporate them into the larger project, from a financial perspective,” Richter said. More than a dozen residents and business owners, including the owner of Eddie’s, spoke in support of the demolition plan. Several said Richter’s proposed development would be more of a catalyst for additional redevelopment in Mount Vernon than saving the existing buildings. They said Mount Vernon hasn’t attracted as much new development as some other city neighborhoods and they believe Richter’s project could help trigger additional construction on surface parking lots in the area. “We absolutely cannot transform our neighborhood if we keep maintaining the status quo year after year,” said Steve Shen, a representative of the Mount Vernon Belvedere Association, which supports the project. That block of Eager Street has already lost many of its 19th century buildings, which were replaced by Art Deco structures, reasoned Charles Duff, president of Jubilee Baltimore. The remaining structures on the south side “are not big enough or historic enough to establish a context or tell a meaningful story” about the neighborhood’s history, he said. Only a few witnesses spoke in favor of preserving the buildings. They included a representative for the Baltimore Heritage preservation advocacy group and a former CHAP commissioner. Eli Pousson of Baltimore Heritage said his organization wants to see the block redeveloped, but is not convinced that retaining the existing buildings would pose a hardship for the developer. “The buildings are not unusable,” he said. Commission member Larry Gibson said the CHAP staff has to follow narrow preservation guidelines in determining whether a project is economically feasible, but the commissioners are free to take a broader view. 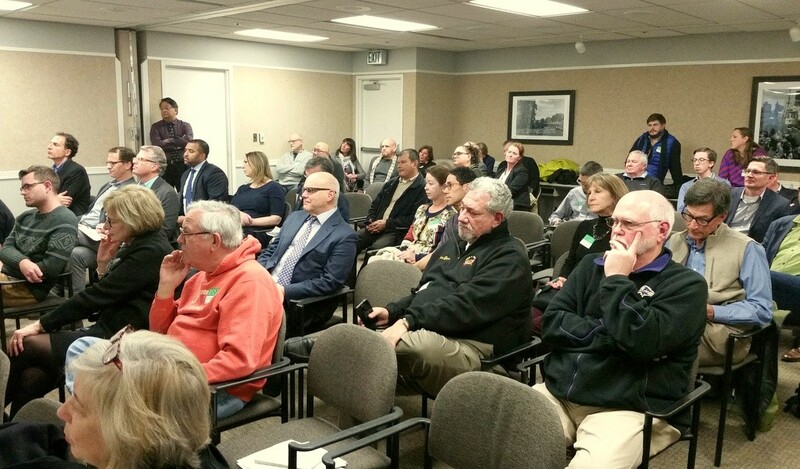 Commissioners Robert C. Embry Jr. and Laura Penza, among others, said they were swayed by the turnout at the hearing and the overwhelming community support for the demolition plan.